The Guild is planning a special tribute to the art of Leopoldo Méndez on July 8. Méndez (1902-1969) was a Mexican artist known for his political and social-justice images, part of a revolutionary arts movement that flourished in Mexico City from the 1930s through the ‘50s. Méndez, a printmaker and engraver, devoted his career to political activism, refusing fame or fortune. A San Francisco-Oakland Newspaper Guild member bought a set of original signed Méndez prints in a Sixth Street secondhand store for the price of a sandwich and donated them to the local. 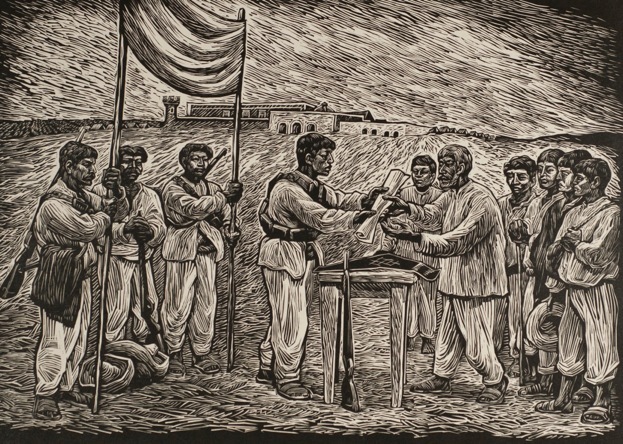 Now the Guild has had the prints professionally restored for permanent display in the union’s Natoma Street headquarters, and commissioned research honoring the Méndez legacy in visual arts, cinema and labor history. This program is part of the Pacific Media Workers Guild’s Bay News Rising summer program for student journalists, which encourages fair treatment of student interns and education in the field of labor reporting. The artist’s work will be displayed and a panel will discuss Méndez and his contemporaries, as well as other social-justice issues. Art Display: July 8; 6 p.m. to 8 p.m.
Panel: 7 p.m. to 8 p.m.
Panelists: David de la Torre, Director of the Mexican Museum, Karen Zucor, art conservation specialist, and Carl Hall, Executive Officer of Pacific Media Workers Guild. Location: Mexican Museum, Ft. Mason, 2 Marina Blvd, Building D. RSVP to (415) 298-1335; check this website in case location changes.